The OFFICIAL weblog for the Oklahoma Democratic Party written by our staff and officers. OK Blue Notes provides a quick look inside party activities at the county, state, and national level and takes a positive approach to our mission of electing Democrats. This site is best viewed using the Firefox browser. Governor Brad Henry vetoed SB 507 this afternoon stating that the bill was "flawed" but that he would continue to work for tort reform that balances access to justice for citizens and limits frivolous lawsuits. Oklahoma City – Gov. Brad Henry today announced his veto of tort reform legislation, but continued work on a compromise reform package designed to address a number of flaws in the vetoed bill. “Over the past 72 hours, we have worked diligently with interested parties to address legal concerns about a number of provisions in Senate Bill 507,” said Gov. Henry. “Although we made a great deal of progress toward correcting flaws in the legislation, time ultimately ran out and I was forced to veto SB 507. Saturday was the final day Gov. Henry could act on SB 507, a tort reform measure approved by the Legislature earlier this month. After spending several days reviewing the measure, the governor concluded that several provisions of the bill were unconstitutional and it unduly restricted Oklahomans’ ability to seek justice through the court system. He also thought it did not do enough to curb frivolous lawsuits. Gov. Henry said he is willing to sign a reform bill if it is balanced and passes constitutional muster. “As governor, I have supported and continue to support reasonable and responsible tort reforms that strike a balance between a citizen’s constitutional right to equal justice and the desire to reduce costs for those involved in the legal process,” said Gov. Henry. Gov. Henry cited several areas of concern, including constitutional questions about “hard” damage caps, inequities in the collateral source provision and unintended consequences of the class action and joint and several liability provisions, among other things. A major factor in the governor’s decision was the opposition of Oklahoma Attorney General Drew Edmondson. The state’s top law officer said Thursday that SB 507 would make Oklahoma’s efforts to protect water quality and prevent pollution virtually impossible. Edmondson also raised concerns about the state’s ability to pursue other legal actions designed to protect its citizens. “Obviously, the attorney general’s opinion carries great weight with me. I think it would be a huge mistake to tie this attorney general’s hands or the hands of any future attorney general when it comes to protecting our state and its citizens,” said the governor. SB 507 did not do enough to curtail frivolous lawsuits, according to the governor, and instead focused on the amount of damages awarded and recovered after a judge or jury found a defendant guilty of negligence. “The key to curbing frivolous lawsuits is stopping them at the front end of the legal system, not limiting the damages or penalties awarded at the back end after a guilty verdict is handed down. SB 507 did little to help innocent business owners who rack up costs fighting a frivolous complaint that is ultimately thrown out of court,” he said. Gov. Henry also addressed claims that SB 507 contained the same provisions that he originally proposed in a tort reform package in 2004. The governor called such suggestions a “total misrepresentation,” noting that while the two measures addressed similar subject matter, they were very different when it came to the actual language and expected outcomes. “It simply isn’t true to suggest that these reform packages were the same. Anyone who does a line-by-line comparison of the bills will clearly see that they are different proposals with different outcomes,” he said. The governor said it might have been possible to correct problem areas in SB 507 if lawmakers had spent more time on the bill. The measure was a three-page bill when it was originally approved by the Senate in February but grew overnight to a 130-page measure when it was heavily amended by House leaders. Amendments by rank-and-file House Democrats were not heard and the measure passed on a lopsided partisan vote. A similar process occurred in the Senate where no committee reviews or amendments were allowed. “Policy should drive any legislative debate, but unfortunately, politics often intrudes, and that was the case with SB 507. Had the authors of this legislation reached out to build a consensus they might have produced a reform bill that I could have signed into law. Instead, the legislation was loaded up with more than 100 pages in amendments and rushed through the process in a matter of days,” said the governor. In recent days, many urged a gubernatorial veto of SB 507, including Attorney General Drew Edmondson, Mothers Against Drunk Driving (MADD), the Professional Firefighters of Oklahoma, the American Association of Retired Persons (AARP), the Coalition of Oklahoma Surface and Mineral Owners (COSMO) and the Consumer Federation of America, among others. Members of the business community, meanwhile, had encouraged approval of SB 507. “There are good people with good intentions on both sides of this issue, and that made this decision very, very difficult,” said Gov. Henry. 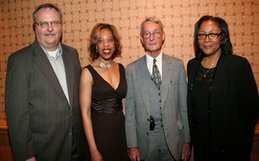 ODP officers (left to right): Secretary Walter Jenny, Vice Chairman Kitti Asberry, Chairman Ivan Holmes, and Treasurer Jana Harkins. Watch John Stewart Talk About "Fake News"